The various facets of New York and Coney Island, where the ornate park of the title is located, are scribed in intimate detail: the notorious jail The Tombs, City Hall, the Triangle garment factory, immigrant housing, whiskey bars, and strip joints, all are nicely animated. Meanwhile, dozens of characters stroll through these various locales: Sigmund Freud and Carl Jung visit New York and observe the vulgarity of America; Trick the Dwarf tells of the bizarre and the humane at Dreamland — the dwarfs and the bearded ladies — which is the most familiar world he knows; and Esther, a garment worker alienated from her immigrant family, takes an active role in the labor movement. Also on hand are Gyp the Blood, a small-time criminal; Big Tim, the Tammany politico, plus Kid Twist and Sadie and Clara. was finally issued in paperback this fall. to which some people will sink to exploit his weaknesses. I had the opportunity recently to address questions, via e-mail, to Kevin Baker about his latest novel, and didn’t hesitate to take it. We discussed his interests in historical fiction, the rich immigrant story of William O’Dwyer and his brother, crime and social optimism in post-World War II Manhattan, and a great deal more. J. Kingston Pierce: You weren’t born in New York City, but rather in New Jersey. Yet after attending Columbia University there, you never left. Was there something about old Gotham that made it easier for you to imagine your future there than anyplace else? Kevin Baker: Actually, it was much more the New York of the time, 1970s New York, that drew me. The city had many problems then, but it was also a very exciting, vibrant place to be; a very cheap place for an aspiring writer or artist to live. I had ties to the city already. My mother was born in Washington Heights, my father on Fordham Road. I had some idea of what it was like already, and I couldn’t wait to go live there. The love of its history only came later, as I began to know, and wonder how it had come to be what it was. JKP: Your official bios all seem to leave a huge gap between your earning a degree in political science and your becoming a novelist. Can you briefly explain what happened during those “lost years”? Did you ever use that political science degree? decisions I ever made, but I regret that poli sci degree. I would have been better off, I think, majoring in straight-out history, or English. But thanks in part to the college’s core curriculum, I was exposed to any number of great thinkers and writers I had no inkling of when I went there as an 18-year-old — which is why the core is so important. No, the “gap” just reflects my doing whatever sort of work I could — largely freelance writing, copy-editing, proofreading — while I tried to write and sell fiction. I began writing five pages a day on a novel the week I started college, thinking I would surely publish my first book before I graduated. Instead, it took me 15 years before I sold a lick of it! is a valuable trend? And are there risks that novelists run in featuring historical figures in their fiction? KB: That’s a very good point, I think Doctorow did indeed open up the floodgates with Ragtime. He’s really been the father of modern historical fiction, I think. One thing I love about his take on the genre is that he’s completely unapologetic about any of it. He feels the fiction writer should write about whatever he pleases, and I think he’s right about that. This gets back to the whole argument over just what “historical fiction” is, and I think we’re very wrong to separate it, and ghettoize it as we do in this country. It’s just as legitimate as any other form of fiction, and in fact through much of history it’s been the dominant form of fiction. their society was, and what it should be. Sure, the genre’s been mightily abused over the years through bodice rippers, and bad detective stories, and hero-worshipping … but what form of literature hasn’t been? Why shouldn’t we be able to write stories about prominent, or simply intriguing, public figures of the past? Naturally, one needs to think it out, because as the famous L.P. Hartley quote goes, the past’s another country, they do things differently there. I would never have a real-life figure saying or doing something in opposition to all that we know about him, or get too far off in flights of fancy about what he might do. But then, we all paint from life. Why is it legitimate to, say, write a contemporary novel based on one’s father, but not to write a historical novel based on a founding father? JKP: There’s always a tendency, when writing a novel based on extensive research, to include as much of that research as possible in the finished product. How do you combat such a tendency in your own fiction-writing? Mr. Doctorow and I differ in our approaches. I was told by one of his former students that he advises, “Do as little research as you can get away with,” when writing historical fiction, and certainly that works for him. For me, I find it’s always the things I wasn’t looking for that say so much, and that’s why I’m happy to do so much research. For instance, in this case I had no idea that Sloane Simpson, the real-life second wife of William O’Dwyer, actually learned how to bullfight while they were in Mexico. Or the whole story of William McCormack, the “Mr. Big” in the book. He was a fascinating individual, and he wielded enormous power in New York, controlling the largest port in the world with an iron fist. But he was virtually unknown by the public in his own time, and is pretty much forgotten today. Characters and details like that are not something you even necessarily know are out there when you start, and they become vital to the work. They not only tell you so much about a time and place, they also fill in all the gaps, and complete the puzzle of your characters. But I do tend to get carried away with it, which is where I have to fight myself. And fortunately, I’ve always had terrific editors to help me, in this case Andrea Schulz and Nicole Angeloro, at Houghton Mifflin. JKP: So let’s talk about Mayor O’Dwyer. When did you first become interested in his checkered career? And what was it you found most interesting about him? (much) older brother of Paul O’Dwyer, who was such a political icon in New York for so many years: the last fighting liberal, always taking on one cause or another, no matter what the odds. of the mob, of the political machines when they were at their most venal and corrupt. What sort of conflicts must there have been there? I went into this initially to tell a story of two brothers. The fact that the real-life Paul O’Dwyer would never say a word against his brother in public, always maintained his innocence, only whetted my appetite. What I found most interesting about William O’Dwyer was that he has this great immigrant story behind him, somebody who came here as a seminary dropout with no money, worked his way up as a hod carrier, a cop on the beat. Went to law school at night, became a district attorney, even a war hero. He comes back from World War II and gets elected mayor, marries the hottest fashion model in the country after his wife dies … and then it all unravels. It’s the classic immigrant story — all gone wrong. JKP: Has this novel made you reassess your views on O’Dwyer? KB: He was much deeper, much harder to read than I imagined. It was not so much that he was a deeply complicated man — because he wasn’t — but that he did a great deal of dissembling throughout his life. You peel back layer after layer, but he remains evasive, and I suspect he did even to those closest to him. And yet, under any close examination, it all crumbles away. He was constantly erecting façades of himself, I think, to shield his real self from the public, from the people closest to him, his wife and his brothers, and I think in the end he may have believed in those make-believe O’Dwyers himself. JKP: You brought up “the classic immigrant story.” Because New York was very much a city of immigrants, you’ve touched on that experience in all your novels set there, I think. But The Big Crowd really exploits the subject. How did you intend to use the history of immigration as a theme in exploring New York City’s mid-20th-century development? KB: Well, it’s somewhat different from the earlier, 19th-century waves of immigration, because now the Irish, especially, have a solid foothold on the city. Previously, in books like Paradise Alley and Dreamland, I was writing about how Irish and Jewish immigrants came here and had to really fight their way up with nothing. By the time Charlie O’Kane gets here, a few years before World War I, there’s already a power structure, there are very strong Irish political machines in Manhattan, Brooklyn, the Bronx. He has to sort of plug himself into it — which is no easy thing, but not quite the life-or-death struggle being an immigrant was. Yet at the same time, it’s a moment when the old Irish-dominated machines were fading. They had been what [W.E.B.] Du Bois calls “folkways,” means to help the Irish survive, and fight their way into the power structure of this country. the proverbial turkey on Christmas. Now, all the other immigrants want in, as well. New York by this time is no longer a city that can just be run by a few men in a room, and it never will be again. It can no longer be run just on some understanding between a few powerful politicians and businessmen, maybe a mob boss or two. We’re all Americans now — and everybody wants in. JKP: As you said before, this is very much a novel about brothers, two quite different people with different approaches to life, who wind up supporting and disappointing each other. What was it about the relationship between Tom and Charlie O’Kane that you found most curious or illuminating? And did the story of these brothers unroll differently, during the course of your writing, than you’d originally expected it would? I think a lot of the dialogue they’re having is about what it means to be a moral person. How do you get the power to do anyone any good, without first getting corrupted? What do you owe to your family and friends, and what do you owe to the people all around you, to the city in general? Tom is much more the idealist, at least at first, and Charlie is trying to show him practical ways to get power, and to do good with it. But you know, it’s so easy after awhile to confuse what you’re doing for the people, and what you’re doing for yourself. JKP: What do you see as the role of Slim Sadler in this novel? KB: Slim is based closely on Sloane Simpson, who was a fascinating individual, somebody who came from old money and very high society. Her father was a Rough Rider with Teddy Roosevelt, one of her mother’s family was a Founding Father, they had cattle empires, and banking empires. But then her father lost all his money, and she had to go make a living as a model. And she was very good at it, she was considered a great actress on the runway. She moved in very high circles in New York society, and really loved that life. She was 23 years younger than O’Dwyer when they met, and she became his second wife, with all of the complications that such circumstances usually entail. She was always flirtatious, and gregarious, and he was very jealous, and that just aggravated everything. Then, down in Mexico, she was very unhappy in this sort of straitened, exiles’ existence they were living. She loved the country, and she loved the culture, but she couldn’t stand being boxed up with this jealous, bitter old man, and she started acting out — learning to bullfight, having affairs. The real Sloane did not do all the things I have the fictional Slim Sadler doing in the novel, which I feel a little bad about because I really liked the real Sloane. She sounds like she was a remarkable person, a real fighter and a hell of a lot of fun. But she said about herself, “I’ve had the morals of an alley cat” — she really did have a penchant for getting into trouble. I think what she represented to William O’Dwyer, and to both O’Kane brothers in the book, was the promise of America. She was the golden girl, from money and position, and to get her was to attain the dream. But then of course, when you do get her, you find out the dream’s not all it’s cracked up to be, and it’s a bit of a lie, and all you can do is worry about losing it. JKP: The Big Crowd makes postwar New York seem like a particularly optimistic place. Or is that your romantic side coming through? KB: Oh, I think it was a very optimistic place! You have to understand, New York was the only great world city that had not been bombed or occupied during the war. It had emerged, almost overnight, as the leading city on the world scene, replacing the old European capitals as the leader in art, and literature, and fashion. It was absolutely dominant economically — far and away the world’s leading financial center, the country’s largest wholesale and retail center, with over a million manufacturing jobs still. Something like 40 percent of the nation’s commerce came through its port. It had easily the highest buildings in the world, the largest population of any city, anywhere. where pretty much anyone could go, and did, and I think it was extremely exciting for people to be in the middle of this, and see everything that was going on. At the same time, there were still people who were excluded from the big party, still restrictions on all sorts of people, that would have to be addressed. Black people still weren’t allowed into most of the leading hotels and restaurants, women were still second-class citizens, gays and lesbians were still outcasts. Columbia, like all the Ivy League schools, had quotas limiting how many Jews could be admitted. Italian-Americans, such a young Mario Cuomo, could not get an interview with white-shoe law firms. So there was all that which needed to be dealt with, and there were fissures of corruption spreading all underneath this lovely structure. And the men at the top were still refusing to deal with it, still clinging to their own power, and enriching themselves. relationships, it’s a story about urban crime. Were there depths or misconceptions of the New York underworld of that period that you were hoping to address? or as powerful as people make it out to be. But this was the period when the crime families in New York had more political influence than they ever had before, or ever would again. Hall going, and they called the shots. This didn’t last, and in a place the size of New York City there are always competing, countervailing political forces and influences. But while it did, the criminals did tremendous, long-term economic damage to the city. For instance, they really brutalized and impoverished the tens of thousands of men who worked on the waterfront, and they stole so much that they pretty much wrecked the old port. JKP: As someone who loved Dreamland, I was delighted to see the character of Kid Twist pop up again in The Big Crowd. But this isn’t the adult version of that criminal tyke from Dreamland, is it? KB:Thank you! But no, this is not the same Kid Twist. It was the longtime habit of New York gangsters to “honor” one another by taking on the name of some particularly famous, dead mobster. Hence, Arthur Flegenheimer was rechristened “Dutch Schultz” after a previous thug. There were, incredibly enough, two Kid Twists, and they both met their end on Coney Island. Moon Hotel on Coney Island. Despite a grand jury concluding that Reles had perished accidentally, there seems every reason to believe that he was murdered by his former gangland pals. From your research, what do you think happened to Abe Reles? KB: Oh, I think he was definitely pushed! The idea that he was trying to escape, or play some prank, as the police speculated at the time, is just ludicrous. Reles was a seriously ill man, and he was desperately afraid for his life. There is no way that he was trying to lower himself down from a ninth-story window on a set of tied-up bed sheets — something I make plain in the novel. He was a terrible little man, a top assassin for Murder, Inc., the legendary Brooklyn mob, who was thought to have killed over 60 men during his career. Sing, including “Lepke” Buchalter, to this day the only mob leader ever executed in the United States. out on Coney Island, with a 17-man, ’round-the-clock police guard, behind an iron door. As everyone wanted to know at the time, how could this have happened? Who did it? Was it crooked cops? The other four mob witnesses Reles was being held at the Half Moon with? Who ordered it? The mob? McCormack? O’Dwyer? 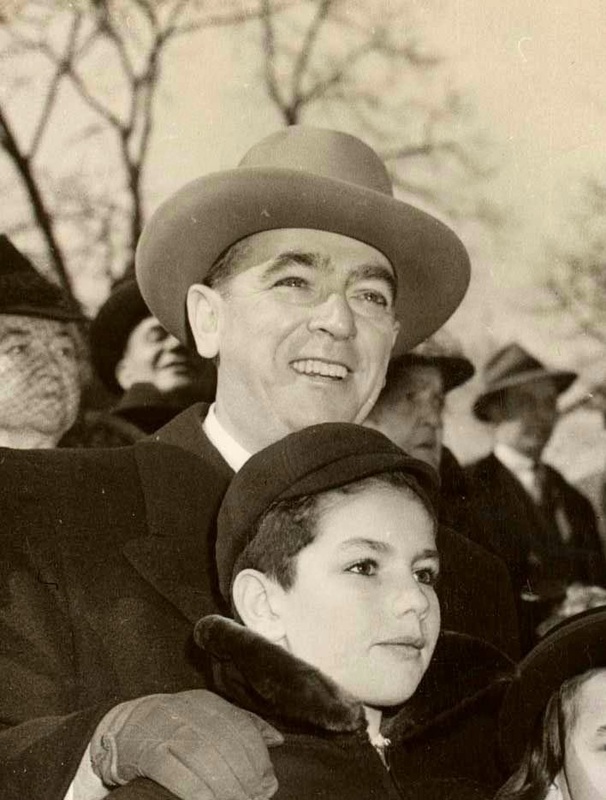 Hearings, the first, televised corruption hearings in history, and they held Americans riveted to their brand-new television sets — and helped wreck O’Dwyer’s reputation. Was he involved? Who did it? It’s the greatest mystery in the annals of the mob. I offer a solution that is very closely based on the real facts of the case and, I think, holds up pretty well. Read it and find out! JKP: I know you’re penning fiction here, but is it really credible that a district attorney would assign Tom O’Kane to investigate his own brother in relation to Reles’ “suicide”? over his brother, maybe even life-or-death, in this matter. I wanted the stakes to matter. And, I wanted to introduce the legendary Manhattan D.A. of the time, Frank Hogan. I see this book as the first of a planned “City of Gold” trilogy focusing on New York in the 1950s, with Tom investigating three of its iconic scandals: the Reles murder and waterfront corruption; college basketball point-shaving cases; and the quiz show fix. JKP: I have to admit, as I was reading The Big Crowd I kept remembering Robert Penn Warren’s All the King’s Men. Is Charlie O’Kane your Willie Stark? KB: Thank you, that’s a tremendous compliment! But where Penn’s Willie Stark, being based on Huey Long, is much more a force of nature, someone whose ambition and ruthlessness puts him on a fatal course, Charlie O’Kane is much more a hesitant character, a man whose fears about the terrible nature of the world as he saw it in the Depression and World War II, whose self-doubts and whose vanity leaves him prey to being manipulated by more pitiless, determined men. JKP: I was intrigued to see, in a short post you put together for the blog My Book, the Movie, that you’d like to see Breaking Bad star Bryan Cranston in the role of Charlie O’Kane. That would be wonderful casting, I agree. But have you actually seen any Hollywood interest in The Big Crowd? Have filmmakers taken much of an interest in your previous books? KB: I think Bryan Cranston could play anything, and particularly a politician, after seeing him not only in Breaking Bad, but also in that wonderful Robert Schenkkan play about LBJ, All the Way. intense investigations of specific times, and conflicts, and crimes. And I’d be fine with that, I love what’s going on with TV right now. JKP: What other novels do you think do an especially fine job of illuminating New York City’s history? JKP: And I’d be remiss if I didn’t ask: What are you writing next? But I have many more novel ideas, a couple of which I noted above, and I suspect I’ll be returning constantly to New York and its past. ALSO CHECK OUT: A video profile of Mayor William O’Dwyer. I first became aware of Mr. Baker through his time travel baseball book – Sometimes You See It Coming, and I have looked forward to each successive novel. It is a rare talent that can evocatively bring to life times gone by. Mr. Baker and Mr. Doctorow both have this talent in spades, but I would like add Jack Finney to that list. His novel Time and Again predated Ragtime by some five years and is a wonderful example of historical fiction. I just picked up a copy of Baker's Sometimes You See It Coming–the only one of his novels I have not read. I look forward to cracking it open soon.